What's new in Visual Studio 2017 version 15.8.5? Visual Studio Tools for Xamarin now supports Xcode 10, which will allow you to build and debug applications targeted for iOS 12, tvOS 12 and watchOS 5. The iOS 12 provides the next generation of existing features. It also introduces some new features for seamlessly integrating security features for strong usernames and passwords. What are the top issues fixed in Visual Studio 2017? Debugger tooltip does not expand in Xamarin.iOS debugging session [ ^ ]. Debugger won't let me leave execution point (Android) [ ^ ]. After updating to 15.8.1, data tip does not show when debugging [ ^ ]. Debugger data tip does not expand [Editor] [ ^ ]. Exception:MSB0001: Internal MSBuild Error: Already registered for build-time [ ^ ]. Wrong path to resource in manifest for ClickOnce after upgrading to VS 15.8.1 [ ^ ]. ClickOnce Manifest error in 15.8 [ ^ ]. ClickOnce Publish is missing certain references [ ^ ]. ClickOnce: Language file copied to wrong location [ ^ ]. Reference missing in the ClickOnce publish folder [ ^ ]. Compiling non-.NET SDK style F# projects results in an internal MSBuild error unless MSBuild parallelism is set to 1 [ ^ ]. F# is not NGEN'd in Visual Studio [ ^ ]. F# deploys the FSharp.Core 4.5.0.0 binary in the 4.4.3.0 location [ ^ ]. 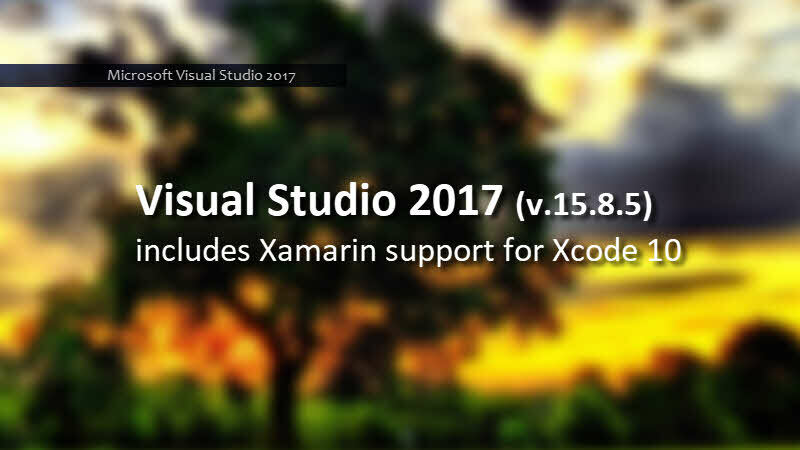 If you have come this far, it means that you liked what you are reading (Microsoft releases a new update to Visual Studio 2017 with Xamarin support for Xcode 10).